Joseph Priestley, FRS (13 March 1733 (O.S.) – 6 February 1804) was an 18th-century English theologian, Dissenting clergyman, natural philosopher, chemist, educator, and political theorist who published over 150 works. 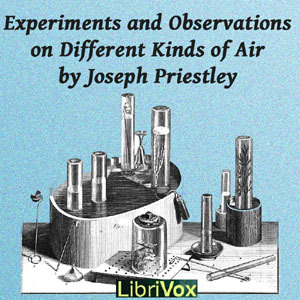 In “Experiments and Observations on Different Kinds of Air,” he reviews experiments with gases. A common theme in this work is measuring the volumes of gases held in glass tubes, and their increase or decrease when exposed to other substances. He also tests the effects of gases on mice, plants and insects. Priestley demonstrated that fixed air (now known as CO2) can be produced from several reactions including alcoholic fermentation, combustion and a mixture of oil of vitriol and chalk (sulfuric acid and calcium oxide). He also showed that it is soluble in water, and that its toxic effects can be reduced when agitated in water. In other experiments, he showed that combinations of gases can mix to form a smaller volume than the sum of both separate gases, as when he combined common air (atmospheric air) with nitrous air (nitric oxide, NO). For some experiments, Priestley tests whether the properties of gases change when stored. He finds that inflammable air (hydrogen, H2 or a mixture of hydrocarbons) becomes less flammable but retains its toxic properties. Also interested in electricity, Priestley tests the effects of gases on sparks. While he finds that gases are generally good insulators, he also finds that some gases change the colors of electric sparks. He also discovers that some mixtures of air explode in their entirety, while others must be combined with common air in order to burn. Priestley uses several terms common to the study of natural philosophy, or chemical experiments as known today. Some of the terms are parts of obsolete theories or are old names for chemicals now given standard names. To better understand Priestley's observations, the following terms are defined according to their present names.